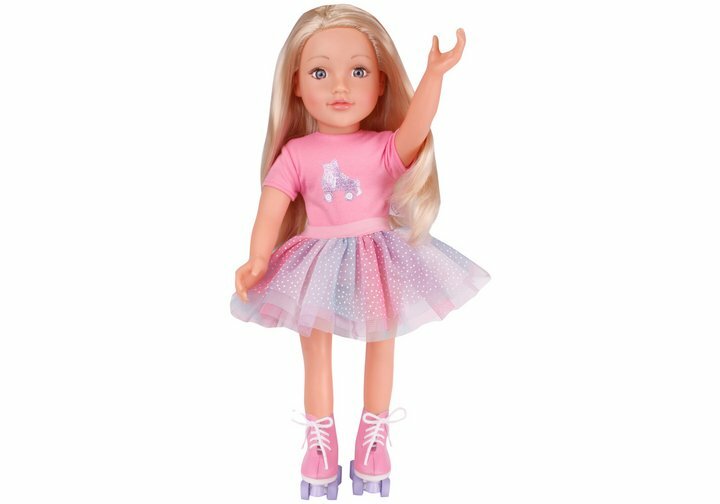 The Chad Valley Designafriend Roller Skater outfit is comprised of a vibrantly coloured multi hued skater skirt with cool white spotted detail and a pretty pink body suit with silver roller-skate logo to really make the suit stand out. The ensemble is finished off with a pair of white laced wheeled pink roller skates - which complement the body suit nicely - so your Designafriend can dart about in style. Doll comes carefully gift packaged in a boutique style box with soft tissue paper and contains a unique charm that can be easily attached to the Designafriend doll charm bracelet. Size H18, W18.5, D4.7cm. Get money off with April 2019 free Argos voucher codes, see if there's a discount code for the Chad Valley Designafriend Roller Skater Outfit product.